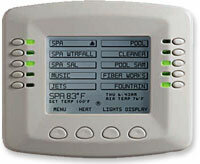 SunTouch Control System is the easy way to keep your pool and spa clean, comfortable, and ready to enjoy. With the touch of a few buttons, you can quickly program your pool and spa filtration and heating cycles to fit your schedule. And it’s just as simple to change programs or switch to manual mode for those unplanned, spontaneous plunges. With SunTouch, your pump and heater automatically run whenever you want, for as long as you want so your pool and spa are always warm and inviting. The EasyTouch control system family offers a new level of control for homeowner’s looking for an affordable, easy to use pool/spa control system. EasyTouch allows full control of all pool/spa features including advanced features such as coloured lighting. 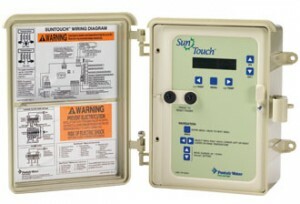 Every EasyTouch system includes an easy to use control panel that is built into the outdoor enclosure. 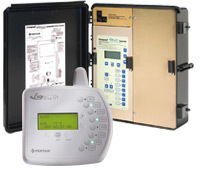 This control panel allows for full system setup, programmability and everyday operation. IntelliTouch automation offers superior control systems from small to the most ambitious pool and spa designs, including water features and spectacular lighting effects. IntelliTouch automation systems are easy to program with simple menus to enable pool owners to create and change programs without complication. The IntelliTouch controller now works with ScreenLogic2 Interface software to allow users to control their pool and spa features from both Apple and Android devices, or PC or Mac computers.